Chung Hyeon, the young South Korean tennis star who is grabbing all the headlines in his quest for the Australian Open title, is rising swiftly both in the tournament and in the hearts of his newfound fans. Following his last win against Tennys Sandgren, ranked number 97 in singles tennis according to the ATP World Tour, Chung has become the first Korean player to advance to the semifinals at a Grand Slam and at only 21 years of age, the youngest to do so since Marin Cilic in 2010. 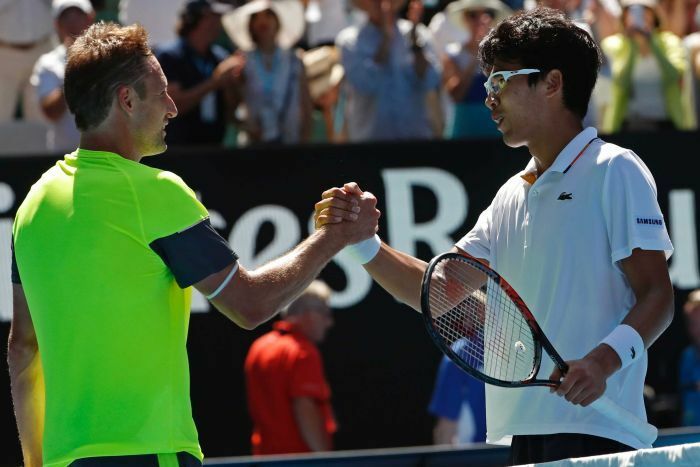 Chung’s Australia Open run began with a match against Mischa Zverev, ranked number 35 in the world, who, citing a viral illness, withdrew in the first round, giving the former the win. Chung next faced off against 53rd ranked Daniil Medvedev, whom he defeated in straight sets, before defeating number four ranked Alexander Zverev in a five set match that was capped with a 2 set comeback. Following the match, Zverev compared Chung to number one ranked Rafael Nadal, insisting that the young star played far beyond his current ranking of 58th and had a bright future ahead of him. Chung then defeated Novak Djokovic, the former number one ranked singles player in the world and a man whom he has repeatedly expressed to be his idol, in straight sets, putting up a performance that drew praise on Twitter from Djokovic himself. Chung then went on to defeat Sandgren in three more straight sets before settling to face number two ranked Roger Federer in the semifinals on Friday. With a world ranking of only 58th, Chung’s success has been, for many, surprising, especially considering his victories over tennis greats such as Djokovic and fellow young stars like Alexander Zverev, the number four ranked singles player in the world. Yet, for others, it is this underdog nature that makes Chung so appealing, both for the veteran stars he has faced and his followers. He has an especial appeal for his Korean followers who eagerly root for a national sporting hero that can bring tennis to a country that usually favors soccer and baseball. Some of Chung’s appeal has already spread to his home country; his win over Djokovic was front page news in many Korean publications. Yet for all of his success, Chung has been, for the most part, remarkably down-to-earth regarding his achievements, with a humble, unassuming attitude that only serves to make him more likeable in the eyes of his fans. In an on court interview following his victory over Sandgren, Chung sheepishly laughed off analyst and former four time tennis champion Jim Courier’s question about who he would rather face in the semifinals.